Today begins the 12 days of postings of our Christmas countdown, in which you may find the perfect quilting kit or notion that you love, or know would be a hit with your quilting buddies and family. All items are available on our on-line webstore which has a secure server, or alternatively, you can call us on our local number (403-253-4419) or toll-free number (1-877-745-6445) to order or inquire. Naturally, if you live in the Calgary area, you can visit our brick-and-mortar store personally if desired. Now for those of you who are experiencing your first Christmas with our store, the tune is “The Twelve Days of Christmas”. How scrumptious are these! The pattern is called Waffle Time, and we have it kitted with some lovely Christmas fabrics. Kit includes pattern; and fabric for top, binding, and backing. Finishes at approximately 18” X 42”. Only want the pattern? It is available separately here. Yes, this has nothing to do with sewing or Along Came Quilting whatsoever. But if it means more money in your pocket for your hobby, thereby having a tiny strand of relevance, perhaps you will forgive my posting this information. So Canadians take note: If you purchased a product that was LCD panels and/or LCD TVs, computer monitors, or laptops containing LCD panels between January 1, 1998 and December 11, 2006, you are eligible to receive money as a result of a class action settlement. Really. This is not some Nigerian tycoon scam. The amount you receive will be based on the number of claims filed and the number and type of LCD products you purchased. Now I know that the time frame was 8-16 years ago, but put your thinking cap on – did you buy a monitor during that timeframe? Or a new LCD TV or laptop? My husband and I thought this back very carefully, and sure enough, we had bought a computer monitor in that timeframe. And since I keep papers well organized, I even found the sales receipt. But don’t worry, even if you don’t have a receipt you can still file a claim! It only took about 3 minutes to complete the on-line claims process. So people, this is not an onerous job. And after I was finished, I thought there has got to be a slew of consumers who don’t know about this. So here is the website with all the information: www.lcdclassactioncanada.com. It is very clear and thorough. Not confusing. And there is no cost to file a claim. And if you still don’t believe me, here is a link to a news article about it: http://www.ctvnews.ca/business/multimillion-dollar-settlements-reached-in-lcd-price-fixing-class-action-1.2000656. Claims must be filed by December 9, 2014. So don’t sit on this and let the deadline pass. Remember, this could be money in your pocket. Well, I’ll admit these panels have been waiting for us for more than a couple of years to feature them. And the staff came up with a wonderful idea of how to best feature the circular nature of the design. They make wonderful Christmas trivets! Layer with your backing, one layer of cotton batting, and one or two layers of Insulbrite. 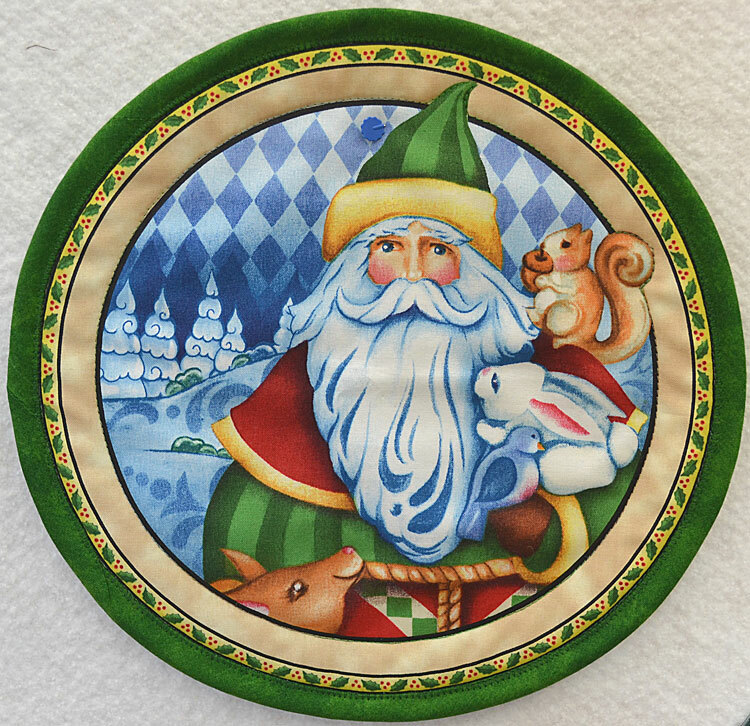 Quilt on the circles, and the inner designs of the Santa. To be really efficient, keep the panel whole for this process. This would be much quicker than dealing with a bunch of little pieces. When you are finished quilting, trim 3/8″ away from the outer edge of the outer circle. Make bias binding 2.5″ wide. You will need .5 meter of fabric to make enough bias binding for all eight trivets. Sew the binding on at a scant 3/8″ (between 1/4″ and 3/8″). For this project, I recommend you sew this on the back side of the trivet first, and then bring it to the front side and hand or machine stitch it in place. This will allow your binding to come just to the edge of the circular design, and you will be able to adjust your binding to finish just where you want it. Below is our store board showing the entire panel and the trivets we made from a couple of the designs. Of course, if potholders are your thing, these would be wonderful for that purpose as well, and you could add a little loop for hanging them. They would be wonderful Christmas gifts. Click on the picture below to find the panel in our webstore.